t’s no secret that the Hollywood Comet loves musicals. Army Private Johnny Grey (Mature) discovers he is an heir of $100,000. However, he has to marry another heiress (Ball) in seven days in order to receive the money. -Mature was having an affair with Rita Hayworth and wanted her to be the leading lady rather than Ball. Mature’s attitude about it didn’t help his and Ball’s relationship, according to The Films of Victor Mature by James McKay. 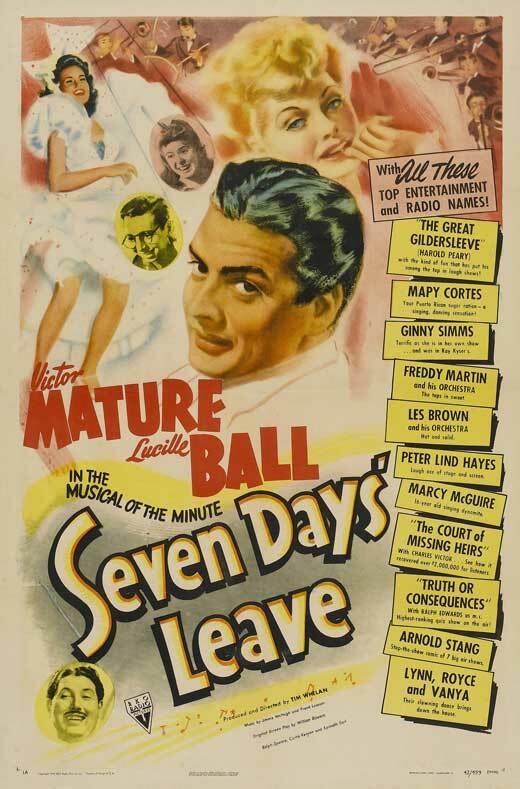 -Remake of the 1930 Gary Cooper film, “Seven Days Leave,” according to 1000 Questions About Canada By John Robert Colombo. -Victor Mature dancing and singing (but dubbed). -Impressions of Lionel Barrymore and Ronald Colman by one of the soldiers. Though they aren’t terrific, I always enjoy hearing impressions of celebrities. -The comedic ballroom dancing routine with Lynn Royce and Vanya. It starts out with a male and female dance number. Then a second man comes in for comedic relief, mostly at the lady’s expense. -“Please Won’t You Leave My Girl Alone” sung by Victor Mature and a group of soldiers at the very beginning and the very end of the film. It’s not a good tune, but it’s the most memorable and catchy. -“Can’t Get Out of This Mood” sung by Ginny Simms with the Freddy Martin Orchestra. This is the best song sung in the whole film. Moody and musically lovely. Neither of the stars were pleased to be in this film and I can’t blame them. The plot of having to marry someone in order to get money isn’t a new one. Romantic mix-ups should be expected. Though I wouldn’t say this movie was horrible, I also wouldn’t go out of my way to watch it multiple times.